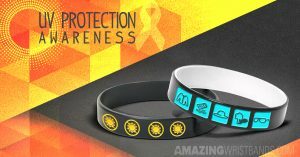 Use Custom awareness bracelets from AmazingWristbands.com for UV protection awareness. The largest organ of our bodies, the skin is like armor, protecting us from infection and injury and especially from sunlight. Years ago, people didn’t fully grasp the importance of that last point—many would even lie out in the sun with baby oil to try to get that “perfect tan.” However, in more recent years, studies have shown that protecting the skin from harmful UV rays reduces the risk of skin cancer as well as the incidents of liver spots, wrinkles, and leathery skin. That’s why July has been designated as UV Protection Month - to raise awareness of the dangers of UV rays and the importance of using proper sun care on skin and eyes. UV Protection Month can help educate people about how to properly protect themselves and be aware of the dangers of UV rays. Wristbands can serve as excellent reminders about UV Protection Month awareness, or they can be giveaways at various summer events. With the sun at full strength in July in the Northern Hemisphere, now it’s more important than ever. Bands can be made as yellow, orange, or red, all colors associated with the sun. Helpful sayings such as “Put on the SPF,” “Don’t forget the sunscreen,” or “Be sure to reapply” can help spread the message about the need to wear and reapply sunscreen throughout the day, especially during the sun’s strongest hours—midday. According to the National Oceanic and Atmospheric Administration (NOAA), there are two types of UV rays: UVA and UVB. Both are harmful in different ways, and especially because they can both result in skin cancer, both require protection. NOAA suggests using sunscreen with SPF of 15 or above, wearing sunglasses, and seeking shade during the midday hours as the best ways to avoid damage from either kind of UV rays. The more unique you make your UV Protection Month wristbands, the more popular they will become. Use our easy online tool to create your custom UV Protection Month wristbands. At Amazing Wristbands, we offer 100% latex-free wristbands, and all of our silicone products are non-allergenic. We offer free shipping, free artwork, free design, and free color matching. There are no minimum order requirements on our most popular wristband styles, and your custom bands will ship within 5-10 days. Build your own UV Protection Month wristbands online today!